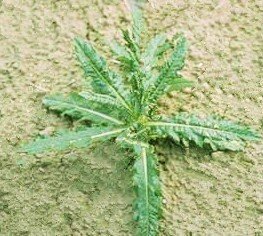 This page lists some common perennial broadleaf weeds, weed identification along with weed pictures, as well as, information on control. On this page, you will find information on Canada Thistle, Mouseear Chickweed, White Clover, Dandelion, Field Bindweed, Ground Ivy, and Common Mallow. If you have a lawn, then you know something about weeds. No lawn is immune to weed problems and they will only get worse if nothing is done. However, not all weeds can grow in lawns. The weeds that become established in lawns will be the types that can handle continuous defoliation through repeated mowing. Weed control begins with weed identification and understanding how weeds grow, because different weeds may require different control techniques. Weeds, like some grass types, can spread by seed, rhizomes or stolons and some can regenerate from root pieces left in the soil. Some weeds can be controlled without using chemicals, while others are almost impossible to control without them. Weeds don't like competition, so a thick lawn is your greatest defense against weeds. Focusing attention on weed control without building a thick turf is a guarantee you will have continued weed problems. The weeds listed on this weed identification page is not an exhaustive list and you may have other weeds common to your geographical area. Be sure to check with your local university extension office for specific conditions in your area. Important Note: A mention of any herbicide is not an endorsement, but is only a list of effective products. Different states or even regions within states have specific laws pertaining to herbicide use. Your local university extension office can be a great help in determining what products are available to you. Not all herbicides are available for homeowner use and the EPA is removing or adding herbicides frequently. Always use and store products according to instructions on the label. Forms a rosette leaf pattern in mowed lawns that look like spiny dandelion leaves. Spines are painful if stepped on barefooted or if touched. Spreads by seed and rhizomes. 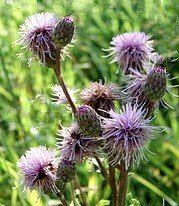 Classified as a noxious weed throughout the U.S.
Canada thistle is an herbaceous perennial with spiny leaves and erect stems. The leaves are long and deeply lobed. They are narrowest at the base and reach their greatest width just before the tip. In pastures or other places that are not mowed frequently, the stems reach up to 4 feet tall producing a lavender or purple flower on top. It flowers from June through September. In mowed turf, Canada thistle doesn't produce stems or flowers, but rather takes on a rosette pattern with numerous leaves. The top photo shows what it looks like growing in a lawn. It spreads by seed and by rhizomes. Due to the thorns on the leaves, bare hands should not touch these plants. Grabbing it by the hand will make weed identification fairly easy, however, but I wouldn't try it. Attempts at removing this plant by mechanical means are not effective. Any root as small as an inch in length that is broken off and left behind in the soil will produce another plant. In most cases, you only succeed in producing far more plants than you started with. Research shows that a thick, vigorous growing lawn will help prevent Canada thistle from establishing. Canada thistle can be difficult to control due to the creeping root system. Often more than one application is necessary for control. In pastures, this is an extremely invasive weed, costing millions in control and in crop losses. In lawns, herbicides with Dicamba as the active ingredient can be used at any time of the year when the weed is actively growing. The younger the plant, the better the results. Also Clopyralid (plus 2,4-D) is a good choice. Many herbicides are formulated with three different active ingredients to provide the best results. If you purchase one of these, make sure Dicamba and 2,4-D are two of the ingredients. Always follow label instructions. Winter perennial (Common chickweed is similar to mouseear chickweed, but is a winter annual). Produces stems that grow prostrate and also upward. Reproduces primarily by seed, but will also root at the nodes. Can grow quickly becoming quite thick by mid-spring. Due to the small leaves, careful examination of leaves is necessary for positive weed identification. Mouseear chickweed is a winter perennial that grows vigorously in the spring. It gets its name from the shape of the leaves that resembles a mouse’s ear. It prefers to grow in full sun and can tolerate slight shade. As it grows, it hugs the ground, but will also send shoots upward. Mowing is not an effective means of weed control, but will actually stimulate this weed to produce more shoots. It can form thick, heavy mats on the soil surface, which can choke out any grass growing within it. For proper weed identification, look for small leaves that are approximately ½ inch long and grow opposite each other. At the end of each stem will grow a set of leave with a small, 5 white petal flower in the center. The primary method of reproduction is by seed, but it can also root at the nodes along the stem. It is not advised to attempt pulling the plant up by hand. The fleshy stems break easily and since the stems root at the nodes, it will only cause the plant to spread faster. When pulling, the stems break where they have rooted and that rooted stem will become a new plant sending out more stems. As with all weeds, good turf management practices that encourages a thick turf is the best method of keeping mouseear chickweed from starting. This includes proper mowing, fertilization and liming, if needed, will ensure a healthy turf. Many herbicides are labeled for mouseear chickweed. The best time to spray is when plants are actively growing. The small, younger plants will be easier to control than the older, more established plants. It may require more than one application spaced three for four weeks apart. The small seeds will ensure new growth the following year. Spend time encouraging turf growth, which should include over-seeding or plugging if necessary. Most weeds do not like competition with vigorous growing grass. Prefers moist soils that are low in nitrogen. Produces white or pink flowers. 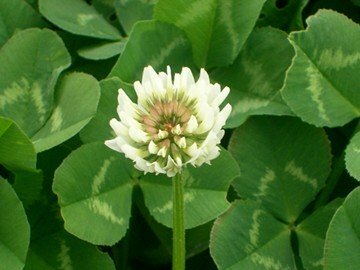 White clover is a common perennial legume that spreads by stolons (above ground stems) and root at the nodes. The plant has a compound leaf structure that divides into three leaflets. There is the very rare four-leaf clover (I have only seen one). Irish folklore says the person who finds it will have good luck. Some leaves contain a white stripe or watermark that is visible from several feet away. Looking for this stripe makes weed identification easy. The flowers can reach a ½ inch in diameter and are a favorite for honeybees. The flowers are usually white, but can also be pink in color and can be seen from late spring through summer. White clover prefers to grow in thin turf and in soil that is low in nitrogen. Maintaining a thick, vigorous turf that receives regular fertilization, as required for the grass type, will help keep clover from germinating. Attempts at removing clover by pulling it up by hand is not effective. The stems will break at the rooted nodes. Each piece left in the soil will form another plant. In most cases, pulling it up will actually help the clover to spread faster. Chemical control is the best method of controlling white clover. Since white clover is a winter (or cool season) perennial, it is actively growing in the cooler parts of the year. Early spring when temperatures are above 50 degrees is the best time to spray. A common herbicide called 2,4-D (Weed-B-Gone)is not effective in controlling clover. Look for herbicides that contain two or three different herbicides mixed together. Dicamba or MCPP will be effective. Not all herbicides are available to homeowners or legal in every state. You will find several herbicides are labeled for white clover. It may require an additional application three or four weeks apart for best control. One of the most recognized weeds. Deep lobed leaves in rosette pattern. Bright yellow flowers extending above the plant on a fleshy stalk. Fluffy seed ball that takes flight when blown upon. Dandelions are cool season perennials and one of the most easily recognized lawn weeds. They have deeply lobed leaves with yellow flowers and white, fluffy seed heads. The white seed heads sail away in the wind and have been a long time favorite of photographers. The dandelions have a deep taproot that slightly resembles a carrot in shape. A mature root can extend as deep as a foot into the soil. A new dandelion plant is able to regenerate from a severed portion of root left in the soil. For this reason, if pulling up the plant by hand, it is important to try and get all of the root. For weed identification, look for leaves that are deeply lobed and form a rosette pattern on the ground. During the first year of growth, the leaves may be only a few inches long, but over time, can grow to three times that length. One to several fleshy stems can grow upward from the center of the plant. These stems grow quite rapidly after mowing and can reach their pre-cut height in only a few days. Being cool season perennials means they are active in the cooler times of the year. Throughout most of the U.S., as temperatures warm in early summer they will go dormant, returning again in the fall as temperatures cool. However, the number of dandelions producing flowers and seed heads will be less in the fall than in the spring. 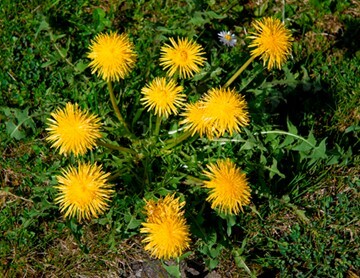 Beginning in early spring, dandelions will produce a yellow flower. The flower remains for several days until it is replaced with a white seed head. These seed heads can reach the size of a golf ball. The fluffy seeds are easily dislodged and can travel great distances in the air. These stems, flowers and seed ball are other important weed identification elements for this plant. Seed germination is the primary method of dandelion reproduction. Lots left untreated can become overgrown with dandelions in just a few years. Pulling dandelions is not usually an effective method of control. Any small piece of root left in the soil will produce another dandelion. If you choose not to use herbicides, make sure you get the whole root, if possible. Dandelions are most easily controlled with postemergent herbicides. Many products are available, but most any herbicide containing 2,4-D, or 2,4-D with Dicamba will control them. Liquid formulations offer better control than most granular "weed and feed" types. If you use a granular product, use one with small flakes rather than round granules. The product needs to stick on the plant and the round granular types tend to roll off. Long, arrowhead shaped leaves 3 to 4 inches long. 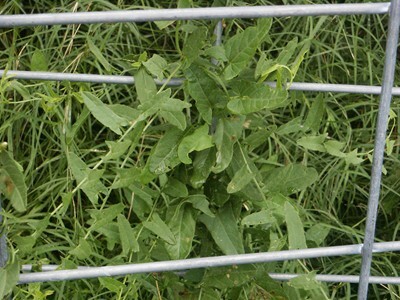 Field bindweed is often seen growing over other plants or fences. Related to Morning Glory and has small, white morning glory type flowers. Has one of the deepest root systems of weedy plants. Field Bindweed, sometimes called “creeping jenny”, is related to the morning glory plant. It is most commonly found in the Midwest and extends through central Canada. It is also found in Hawaii. Field bindweed is actually a vine and possesses all the characteristics of a vine. It can be seen growing up fences and covering shrubs and other plants. In poorly maintained lawns, it will spread out along the ground. Field bindweed is often confused with wild buckwheat. However, wild buckwheat is an annual and has greenish flowers. Annuals will die each year and grow again from seed. These facts should help confirm a positive weed identification. Mature, older plants have a very extensive root system. Roots can extend 15 feet into the soil and branch laterally for 20 feet or more. This complex root system makes field bindweed hard to control. Even when sprayed, it can return a short time later. Young plants, however, are easily controlled with herbicides. The funnel shaped flowers can be white to pink and appear in late summer to fall. The plant reproduces by seed. The seeds can remain viable in the soil for many years. One university reported a seed germinating after 28 years. Young plants may be able to be removed by pulling or hoeing. For older plants this will not work. The plant will always come back. In gardens, plastic or landscape fabric should be put down. Where field bindweed has been left uncontrolled, people have reported the plant covering all their garden plants. Keep in mind that seeds from field bindweed can remain viable in the soil for many years. Once the plastic is removed, germination can occur, starting a new crop. If you live in an area where field bindweed is a serious problem, you will need to consider what measures you will take to control it. Chemical herbicides are about the only sure way of controlling this pest. Chemical control is the most effective way of controlling mature field bindweed plants. Several broadleaf systemic herbicides are labeled for this pest. For mature plants, it may take a couple of years to completely kill this plant. Look for dicamba plus 2,4-D, or triple herbicide products. Scalloped, round leaves up to an inch in diameter. Ground ivy has square stems. Leaves grow in pairs positioned opposite each other on the stem. Grows in shade and full sun. Can be difficult to control. Ground ivy, sometimes called creeping Charlie, is a perennial weed that can grow very quickly in thin turf. It was once planted as a shade ground cover, but because of its aggressive nature, is now considered a pest. Ground ivy spreads by above ground, laterally growing stems, called stolons. These stolons can outpace the growth of turfgrass. This is especially true in shaded areas. However, in lawns with thin turf, ground ivy will grow equally well in both shade or full sun. For positive weed identification, look for leaves growing on a long petiole, positioned opposite each other on square stems. In the spring you can see small blue flowers in the shape of a funnel which will help with weed identification. 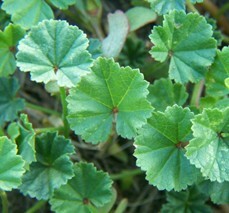 Ground ivy is similar in appearance and sometimes mistaken for another lawn weed called “common mallow”. Ground ivy is difficult to remove without the use of herbicides. Unless the entire runner is removed, it will re-establish. The runners root at the nodes, so if you break the runner at any point, it will continue to grow. If your neighbors have it in their yard, it will only be a matter of time before it spreads into yours. If possible, encourage your neighbors to begin controlling it. Many herbicides are labeled for ground ivy. It will generally need several applications spaced approximately 4 weeks apart for best control. Ground ivy behaves as a cool season perennial, so the best time to spray is when it is actively growing in the spring and fall. Persistence is the key. Use products containing Dicamba plus 2,4-D or triple herbicide products. If your neighbors are unwilling to work with you in controlling this pest, then a barrier may be needed to keep it out of your yard. Resembles ground ivy in appearance. Grows from a tap root and does not form nodes along the stems. White to lavender flowers from late spring to early fall. Common mallow is an annual, but can be a perennial is some areas. It is similar in appearance to ground ivy, but positive weed identification is easy when the root is exposed. Mallow has a tap root and the stems do not form nodes. (Nodes are swollen areas along the stem with cells that are able to produce roots and/or vegetation. Plants with nodes can be more difficult to control.) It reproduces by seed and spreads by producing stems that grow along the surface of the ground. Maintaining a dense, vigorous turf is the best way to prevent mallow from establishing. Once established, it is possible to pull up the plants since each plant has a single tap root. Try to remove the entire taproot. Spot spaying with a selective herbicide labeled for mallow can also be effective. 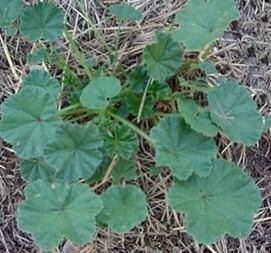 If you decide to use herbicides for control of common mallow, it is best to spray when the plant is young and growing. Homeowner herbicides containing 2,4-D and MCPA is a good combination that will control this weed. Using a "sticker/spreader" according to label rates will help with chemical absorption into the plant tissue. A sticker/spreader, when added to the herbicide formulation, allows the herbicide to not only stick to the plant surface, but spread out evenly. Summer annuals begin from seed in spring or summer and die at the first frost. Click here to learn more about these invasive weeds, including photos, growth habits and control methods. The coming of spring also brings a surge in winter annual weeds. Here you can find helpful information on these difficult weeds, including photos, growth habits and methods of control.